Villa For Sale – Luxury Property with Swimming Pool in Santa Ponsa – Great Opportunity at a Reduced Price! A fantastic luxury five bedroom, four reception room, villa located in the beautiful area of Nova Santa Ponsa, in a tranquil setting, surrounded by mature trees and gardens, with distant mountain views. Beautiful terraces wrap around this listing on both ground and first floor levels, with the lower terraces being covered and protected from the sun which lead on to the swimming pool and gardens. In addition, this listing offers independent living quarters at the rear of the listing, for an employee or guests. The listing is extremely open and light, with a large lounge which opens on to the dining room area plus two further reception rooms, one with bi-folding doors that open up onto the garden. A beautifully designed five bedroom villa, with two separate self contained annexes with exquisitely designed tropical gardens and a private pool, situated in Sa Coma, Bunyola. The listing benefits from fantastic panoramic views of the Sierra de Tramuntana mountain range, from the frontal aspect of the listing and its terraces. 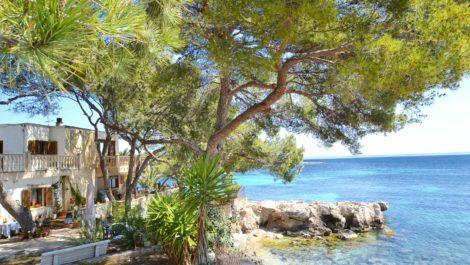 Located just a 10 minute drive from Palma, this listing offers a tranquil retreat within a short distance from Palma and Bunyola.